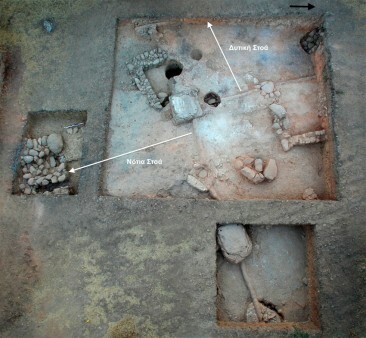 Aghios Vassilios of Xirokambi: Room A10 (excavation season 2012). It is one of the most interesting and most promising Greek excavations, whose distinction in an international archaeological forum may seem natural, but it’s not to be taken for granted. 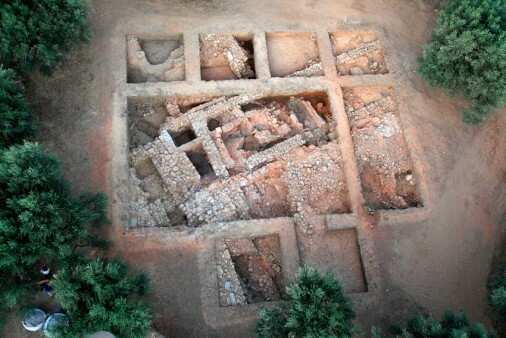 Ongoing surveys in Aghios Vassilios of Xirokambi (Municipality of Sparta), in Laconia, led by the Emeritus Ephor of Antiquities Adamantia Vasilogamvrou, have brought to light finds which confirm the importance of the archaeological site, such as the remains of a Mycenaean palace, Linear B tablets, numerous fragments of wall paintings, bronze swords, and various valuable objects. The excavation, along with nine others from all over the world, was presented during the inaugural Shanghai Archaeology Forum (SAF), held from the 23rd through the 26th of August 2013 at the China Art Museum of Shanghai. Given the fact that no other survey conducted on European ground was included in SAF’s programme, the distinction is regarded to be very important for the Aghios Vassilios team and for Greece. Out of 99 surveys, initially proposed and belonging to two categories (new field surveys and research programmes), the Archaeological Programme of Aghios Vassilios in Xirokambi of Laconia made it to the final list of the ten new field surveys presented in Shanghai, as Mrs. Vasilogamvrou said to ANA-MPA. Nine surveys were chosen for the second category. Referring to the fact that the SAF brought together archaeologists and researchers who study civilizations in different parts of the planet, Mrs. Vasilogamvrou commented: “Especially for us Greek archaeologists, I think this contact [with other scientists of different civilizations] is of special interest: It helps us come out for a while from the field of Greek-Roman civilization, in which we are somehow shut off – of course with good reason, given the richness and range it has in modern Western world”. She added that these kind of events place Greek culture in the overall framework in a more appropriate way. “The fact that our culture is very important and that it has left its mark on Western culture is indisputable. Nevertheless, this given fact often proves to be restrictive for us. On the other hand, it tends to be very mind-broadening if one sees the ‘big picture’, in other words, when one realizes that at the same time other things are happening all over the planet. Personally, I think this was the most important thing about the Forum. Apart from the fact, of course, that one gets to see how programmes work in other countries, the pros and cons – it is very helpful” she pointed out. Eveything started when Professor of Classical Archaeology at the University of Athens Olga Palagia submitted a proposal about Aghios Vassilios to the Nomination Committee of SAF. After a strict evaluation procedure, carried out by the Selection Committee, consisting of 40 scientists from different parts of the world, the final selection of the Greek excavation was a fact. The presentation, made on the 23rd of August in Shanghai and in front of a big international audience, draw the attention of many people, not only archaeologists. Among them was Professor Lord Colin Renfrew, an eminent archaeologist, regular visitor and researcher of Greece, whose contribution in the fight against looting is very significant. “After our presentation, he came and asked a lot of things about Aghios Vassilios. We had a very constructive conversation” says Mrs. Vasilogamvrou. “Another fact that surprised me was that out of 19 surveys which were selected for the SAF only three are led by women (…). I think this is strange, given the fact that –in Greece, at least– the field of archaeology is largely dominated by women. The Shanghai Archaeology Forum –which will be held every two years– is a non-profit organization promoting “the investigation, presentation, and protection of the world’s archaeological resources and heritage. It serves as an international platform for the illumination of archaeological research and its significance and relevance to the world today”. The forum is fully committed to excellence through innovation and cooperation, and to the sustainable development of human society. 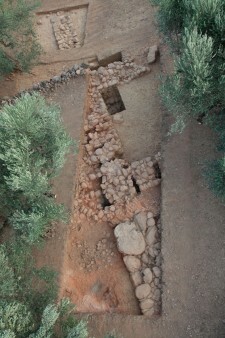 Aghios Vassilios of Xirokambi: The east side of «Building D» (excavation season 2011). 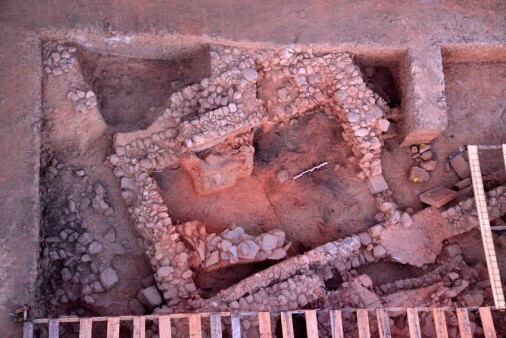 Aghios Vassilios of Xirokambi: The southwestern corner of the Central Court, with parts of the South and West Stoa (excavation season 2012).